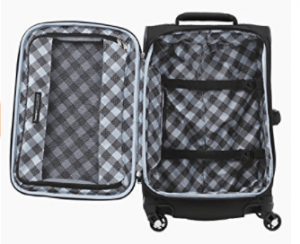 Travelpro Maxlite 5 (4011761) is a 21-inch expandable, very lightweight and durable cabin bag with spinner wheels. It is offered in four different colours of black, azure blue, dusty rose and slate green, with black 7 dollars cheaper at the moment. But please note that you’ll be less likely to lose the coloured (non-black) ones at the airport terminal in a crowd of bags. This upgraded Maxlite 5 weighs about half a pound less than the Maxlite 4 and has the horizontal rather than vertical and has a bottom tray design in-between the spinner wheels. 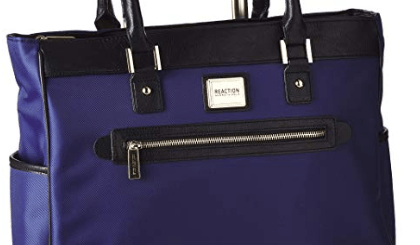 There are two exterior compartments, great organizational pocket- full-length lid pocket inside, accessory pocket on the side and hold-down straps on the other side giving you great flexibility and convenience. It is a soft-shell bag that is made of polyester with a duraguard coating that is water-repellant and stain-resistant and with a solid high-tensile-strength-zipper.The zippers on the bag are very good quality and include large loops and grips for smaller locks. Four spinner wheels rotate 360 degrees smoothly and easily with the light and solid PowerScope Lite handle with an ergonomic design, a contour grip and comfy and rubberized touch points. This telescoping handle locks at both the 38 and 42.5 inches. The spinner wheels are very sturdy and move- push and pull very easily and you shall have no problems on carpets, pavements on parking and airport terminal grounds. You can align and steer the wheels effortlessly with the unique bottom-tray design. Tipping when expanded by two inches will be prevented with its tapered shape. The 21-inch size will meet the size and weight restrictions of the airlines and, being expandable by two inches it will give you extra storage space. 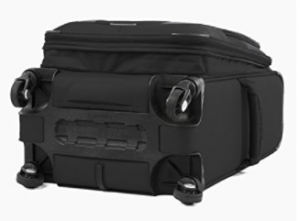 It is one of the lightest cabin bags on the market, weighs only 5.4 pounds and measures 21 x 14 x 9 inches without the wheels or handles and 23 x 14.5 x 9 inches with wheels and handles. It will work for frequent travellers and be enough for a weekend or a few days away for leisure or business. You can take it on the plane and put it in the overhead compartment above you as it will fit in easily. *You’ll get a “Trusted Companion Promise- TCP”, worry-free warranty by TravelPro and great customer support for whatever may go wrong. You need to register within 120 days of your purchase to activate the TCP which will give you free coverage from any carrier- including airline damage for 12 months.